Greek Default Watch: Why is Greece in a Recession? 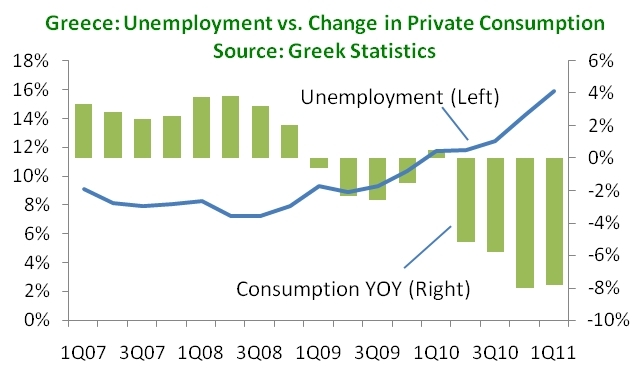 Why is Greece in a Recession? Start with two big picture graphs. The first shows real GDP from its Q3 2008 peak to Q1 2011. Several items stand out. First, only imports have made a positive contribution to GDP in this period (meaning imports fell) – all other items lowered GDP. Second, the drop in GDP has been mostly due to a decline in investment with smaller contributions coming from lower exports and from reduced consumption. Little of the decline came from reduced government spending. That picture, however, aggregates too much information; thus, we need our second big picture graph to investigate further. 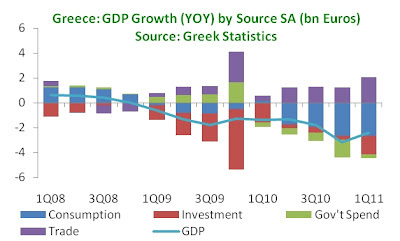 The reality is that Greece has faced two recessions: the first one, from Q1 2009 to Q1 2010 was driven by a contraction in investment and, to a lesser extent, by a drop in consumption. In that time, government spending and trade both contributed positively to GDP. Then came the second phase from Q2 2010 to Q1 2011: this recession came mostly from reduced consumption and, to a lesser degree, by lower government spending. Investment made a smaller negative contribution, while net trade was positive. Investment. Lower investment was the major driver of the first recession in 2009 and early 2009. What happened? The drop in investment is, in fact, chronic. Investment in nominal euros kept rising from 2000 to 2007, but when measured as a share of GDP, it peaked at 24.5% in 2003. It then started a steady decline, before registering a sharper fall in 2009 and then reaching just 14.5% of GDP in 2010. From a sectoral angle, there are several trends. The first is that there was a clear fall in housing investment that started in 2007 – that decline seems steady and does did not accelerate during the current crisis. Instead, the investment-driven recession in 2009 was generated mostly from a fall in metal products and machinery. Consumption. 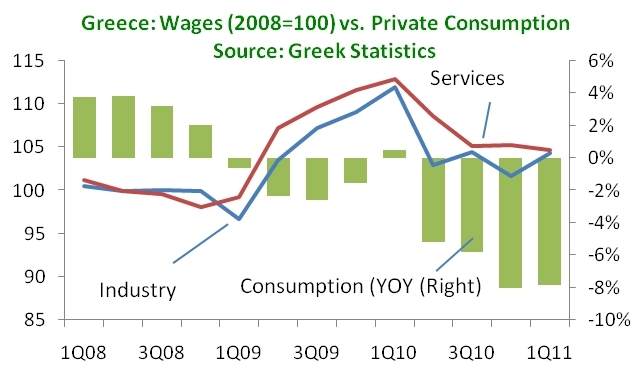 As I noted above, consumption started to fall in Q2 2010. But why? Households are coping with three main challenges: unemployment, less income and higher prices – which is to blame for lower consumption? First, unemployment started to rise in Q3 2008 and it grew more or less steadily until Q3 2010, after which it shot up. That trajectory can explain the drop in consumption that started in Q1 2009 but not the acceleration after Q2 2009. Second, wages were rising throughout 2009 at a time when private consumption was falling – in that period, higher unemployment might have been more to blame for lower consumption than lower wages. In Q2 2010, however, wages did register a drop just when consumption started to fall. 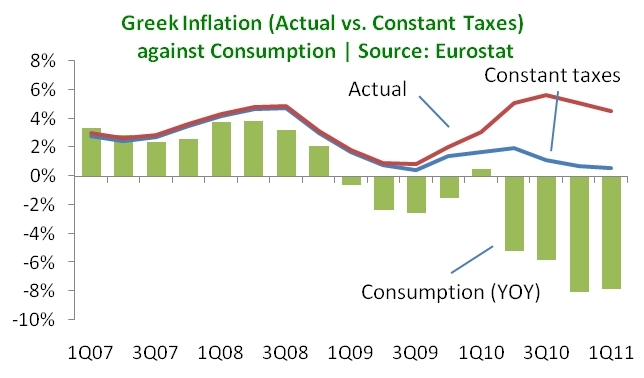 Third, Greek households started to experience significant inflation in Q2 2010 that was driven mostly by tax increases – in fact, when looking at inflation in constant taxes (excluding the impact of tax measures on prices), there was barely an increase. This reality seems best correlated with the drop in private consumption. Government spending. In 2009, government spending was a boon to GDP, while in 2010 it was a drag. 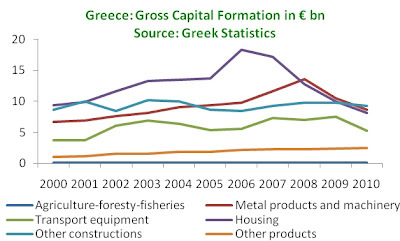 Here it is important to note that, for the national accounts, government spending does not include all government spending – in fact, it includes about half of it in the case of Greece (the rest are payments to households and firms that then consume products and services). Even so, it may be useful to review some basic parameters of government spending because they link importantly to the recession. Broadly speaking, the government has tried to offset the decline in revenues that are the result of the recession by boosting a number of taxes such VAT, tobacco, fuels and alcohol. These items alone yielded more than €2.5 bn in extra revenue in 2010, more than offsetting the reduction in direct taxes that resulted from lower household and corporate income (minus €1.2 bn). Spending has shown a similar trend: the government is reducing direct spending but is seeing an increase in assistance (unemployment benefits and support for pension funds among others). Adding this picture to that for households we see the following: households are hit by higher inflation as the government tries to collect more taxes to offset the recession-driven decline in direct taxes. Government spends less but as the recession and unemployment intensify is forced to spend more to support those in need. Trade. 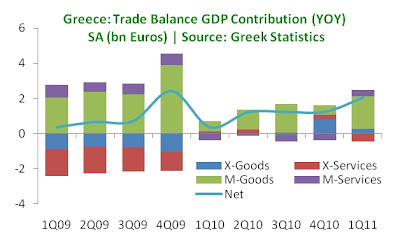 The trade picture is much less clear in part because the data is more opaque and the numbers from the Bank of Greece and ELSTAT are different. Even so, ELSTAT numbers show some important realities. 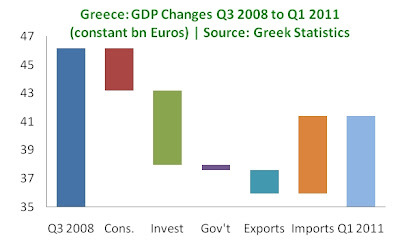 In 2009, the drop in imports (by €13 bn) more than offset the €8.9 bn drop in exports – in other words, trade made a positive contribution to GDP chiefly because, as the recession hit, Greek consumers imported less. In 2010, the picture changed. A reduction in imported goods continued to affect GDP passively, albeit at a slower pace. Exports, by contrast, stopped falling and in fact registered a €1.3 bn rise. But this growth in exports was driven by merely one quarter (Q4 2010). Conclusions. What does all this mean? First, the Greek economy has suffered from a continuous decline in business investment – the recession merely accelerated the drop in one or two subsectors. Households have started to consume less but, at least initially, their reduced consumption was mostly driven by a hike in taxes and lower wages. Rising unemployment is sure to blame as well, but given government support and other measures of income support (family), there is a weaker correlation between rising unemployment and falling consumption. Finally, trade is making a positive contribution but not in a “good way” – rather than seeing more exports, Greece is mostly just importing less. It's normal that exports did not rise significantly. It is much easier to decrease imports than increase exports because of the necessary investment needed. 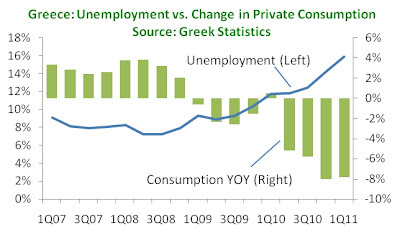 Agreed, Anon; the only reason I highlight it is that in the Greek press, rising exports are often seen as a very bright spot, and I am not sure that it is quite as bright. I think that you hit the nail on the head regarding consumption: not only is gov. a drag, but the taxes that the gov must implement not only diminish final consumption by crowding out spending, but also increase the GDP deflator and therefore cut 'real' consumption growth. Enjoy the blog. "Government spending was a boon to the economy" ignores the fact that a large chunk is debt that must be repaid. If state spending was the solution then giving everyone a million dollar would solve our problems. The Euro raised unrealistic expectations: You can have a German lifestyle without saving, producing, or working hard. Obviously, that is not the case since prosperity based on debt is ephemeral at best. My name is Pascal Giberné, i'm a French journalist working for Le Parisien and i'm writing a piece about Cheniere Energy. How could i get in touch with you this Monday? 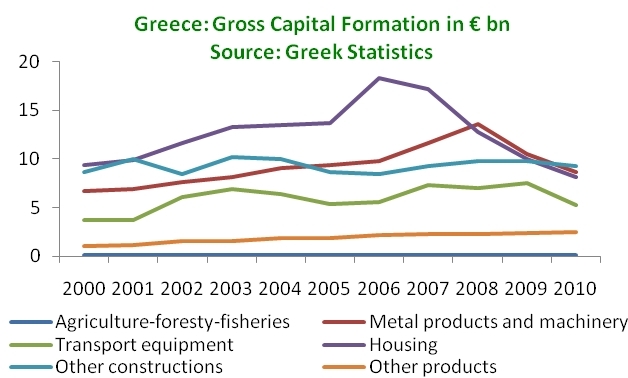 Greece’s New Property Tax: Beginning of the End? 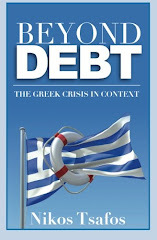 Can Greece Still Avoid Default?